Pupils from three Edinburgh schools – James Gillespie’s, Firrhill High and Liberton High – are to take part in a new tennis project. Tennis Scotland has been working in partnership with the Tennis Foundation and the aim is to grow the game in the schools through close links with coaches and clubs in the local community. 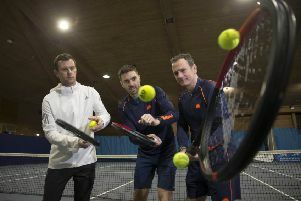 “There is a sharp dip in tennis participation as young people reach their mid-teens and many don’t realise the many varieties of tennis available away from the traditional game,” said Scotland regional development manager (East) Stuart Brown. Twenty-one pilot Schools of Tennis have been established across Great Britain this year with the aim to establish 150 by 2018. Gillespie’s, Firrhill and Liberton will receive around £5,000 worth of support for the pilot and will work across key themes, Teaching and Learning, Student Leadership, Facilities and Equipment and Community Links.